In a tbsp oil add chana dal first, saute for 3 minutes later add urad dal. Add chopped garlic, chilis and whole pepper. Saute everything in medium flame until dal turns gorgeous golden brown as shown in the picture below. You can mix the dry powders with fried dal in the warm pan/kadai (this gives super taste) or later while grinding in food processor. Just mix the sauteed stuff on and off till it cool completely. Once done powder it and adjust salt . Powder it to coarse or fine texture as you wish. Typical South Indian Idli Podi / Chutney Powders remains coarse in texture for kids purpose I make it fine. This remains good for more than a month in room temperature when handled with dry spoon and stored in an air tight container. If you add more oil to saute dals and other podi ingredients then once done spread it on a paper towel to drain excess oil, later add curry leaves and moringa powders. Add chopped garlic so that the inner part cooks completely and turns brown at the time dal changes color. Initially stick with above mentioned quantity of powders and once kids start liking you can increase it. 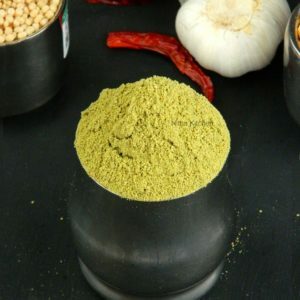 Instead of powder you can add dried curry leaves and moringa leaves or fresh ones which has to be sauteed with other ingredients.